Jesus Came, We’re Loved, Let’s Celebrate! I’m tempted to complicate Christmas. It’s easy to make it about what I do: about how well I can tie bows, and choose party outfits, and make small talk. About how the table is set and the ham is cooked. About how I sing in the service and take notes from the sermon with my neat purple pen. But the angels didn’t say, “Good news! You get to try hard. You get to wear yourself out. You get to make sure you have it all together.” Instead they declared: I bring you good news that will cause great joy for all the people. Today in the town of David a Savior has been born to you (Luke 2:10-11). This reminds me all over again that the heart of Christmas has always been about two things: A child in a manger and childlike faith. I can never hear it enough. Christmas isn’t about hustle; it’s about humility. It’s not about perfection; it’s about grace. It’s not about effort; it’s about extravagant love. Yes, Jesus came. We’re loved. Let’s celebrate! Here’s a Christmas present… my new devotional Hope Your Heart Needs is half off at Barnes & Noble for a limited time! You want the new year to be different, to beat discouragement, to truly believe you’re loved and have new strength for whatever is ahead. I understand because I’ve been there too. Writing Hope Your Heart Needs changed my life and reading it will change yours too (it also makes a great little gift). 2019 really can be better. Note: The last Let’s Have Coffee link-up here will be on December 25th. I’m freeing up some time and energy to work on some exciting new things for you. Sue at Welcome Heart will graciously be hosting Let’s Have Coffee starting January 2nd, and you can link up there! After you link-up your post, take a moment to leave an encouraging comment on the one that’s linked just before yours. Thanks, friends! It seems every nativity set comes with a story. Maybe it’s an heirloom full of memories, a special purchase on an outing that brings back a cocoa-scented moment, a relic from childhood with beloved dust in the cracks, a gift from a friend that came in a package with a red bow on top. I pull my nativity set from the box, releasing it from its blanket of bubble wrap. The pieces are ceramic. Pure white. The donkey is missing half an ear. It belonged to my grandmother and every year I think of her when I set it on my shelf. She had polio at age twenty-eight and spent most of her years in a wheelchair. I loved the patterns her wheels left in the carpet, like a trail to somewhere secret and magical. A pastor came to visit her in the hospital. He said, “Frances, this can make you bitter or better.” She would always say, with a twinkle in her eyes, “I choose better.” I run my fingers across the baby in the manger as I tell myself this story again. The Jesus in this nativity will always mean hope to me because of it. What I love about nativities is that Jesus is unique in each one. In my nativity He is hope and to someone else He might be a reminder of peace and to you He could be comfort and joy. Oh, who He is doesn’t change. But how His love reveals itself in our lives is different in each of our hearts, each of our homes. This is beautiful to me. A kind of Christmas mystery that I will never fully understand on this spinning, broken earth. I arrange the pieces of the nativity. I step back and smile. Then I set Jesus at the center, exactly where He should be. When you think of Jesus, what’s a word that comes to mind like “hope” does for me? Speaking of hope… my new devotional Hope Your Heart Needs is half off at Barnes & Noble for a limited time! Note: The last Let’s Have Coffee link-up here will be on December 25th. I’m freeing up some time and energy to work on some exciting new things for you. Sue at Welcome Heart will graciously be hosting Let’s Have Coffee starting January 2nd you can link up there! 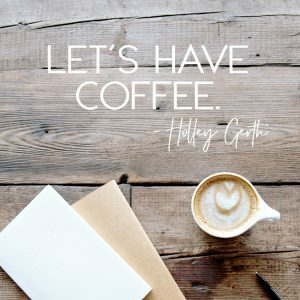 You’re invited to join the “Let’s Have Coffee” link-up! Simply write a post that has the kind of encouragement you’d share with a friend over coffee (the link-up goes live at 5:30am CT every Wednesday, and you can view the Link-Up Guidelines here). Don’t have a blog? You can still write an encouraging comment. If you’re reading this by email, go to holleygerth.com to see all the fun and join in too. I recently audaciously and intentionally asked this question: “What gift am I going to give myself this Christmas?” I already have pink fuzzy socks and flannel pajama pants with hearts on them so I settled on this: Permission to rest. What does rest look like to me? It’s the little things: a nap, a cup of tea, a few moments sitting with my husband on the couch, a cozy blanket, a “no” instead of “yes” sometimes, leftovers for dinner. And, perhaps most of all, giving the critical voice inside my head the holiday season off. I’m sending her somewhere sunny like Florida or the Caribbean or Australia. Anywhere that’s far enough away that I can’t hear her. A one-way ticket, I hope. Both of these make good sense to me. So I’m picking “permission to rest” as a gift to myself because I know if I do then this gift will ultimately be passed on to the people I love and the Savior I serve and this weary world. What gift will you give yourself this Christmas? A gift for YOU: my new ebook, Hope for the Holidays. This post is one of the devotions you’ll find inside the free (for a limited-time-only) ebook. I’d love to send it your way this Christmas! Click here for all the details. Who Else Wants a Less Stressful Christmas? Confession: I often approach the Christmas season like a project. I want everything to look just like the holiday special I saw on television or the spread from the magazine. I make lists of all I need to do. I envision perfectly wrapped packages and lovely treats lining the kitchen counters. The house will stay clean and the lights will glow. My celebration of the Savior will be as peaceful as the nativity scene sitting serenely on my fireplace mantle. But invariably chaos breaks out. Nothing goes as planned. My efforts fall short. I end up frustrated and stressed. Then I feel like I’ve let God down—that I somehow haven’t fulfilled His vision for what Christmas should be. Yet as I watched my giddy nephews build the messiest, most lop-sided ginger bread house I’d ever seen I remembered the words of Jesus, “Let the little children come to Me. Don’t stop them, for the kingdom of heaven belongs to such as these” (Mark 10:14). I realized all over again in that moment that childlike faith is what God wants and it must be different than what I often picture. Surely it’s messier, wilder and more full of grace. It doesn’t care so much about the result as the relationship. It makes room for laughter and chases away expectations. It’s about delight and wonder, humility and self-forgetfulness. I’m not entirely sure about the fate of the infamous gingerbread house. I didn’t bring it home with me but I did take a truth that’s setting my heart free: The best way to celebrate the birth of the Child is with faith like a child. Can I send you a gift this Christmas? If you need an extra dose of encouragement, I’ve created this with you in mind: an exclusive, limited-time-only ebook called Hope for the Holidays. It’s free! Find all the details right here. Hard news drifts in from the television that’s on in the other room as I sit at my desk and try to write. Heartbreaking headlines. Scary statistics. Pessimistic predictions. It seems peace is nowhere to be found on this planet and the night is anything but silent. Our Savior knows there will always be news headlines like the ones I heard. They existed the night He was born as a baby in Bethlehem and will continue until He comes again. But He also knows that because of what He did on the cross and through His resurrection the darkness has already been defeated. So every time we see a Christmas light this year let’s remember this invitation and celebration: “The light shines in the darkness, and the darkness has not overcome it” (John 1:5). The darkness will not last forever. The light always wins in the end. And we can all make this world a little brighter wherever we are today. If Thanksgiving was hard for you this year or if you need an extra dose of encouragement as we look toward Christmas, I hope my free ebook will be just what you’re looking for! For a limited time, this new ebook — Hope for the Holidays — is free! Get all the details here. Holley Gerth © 2019 All rights reserved.